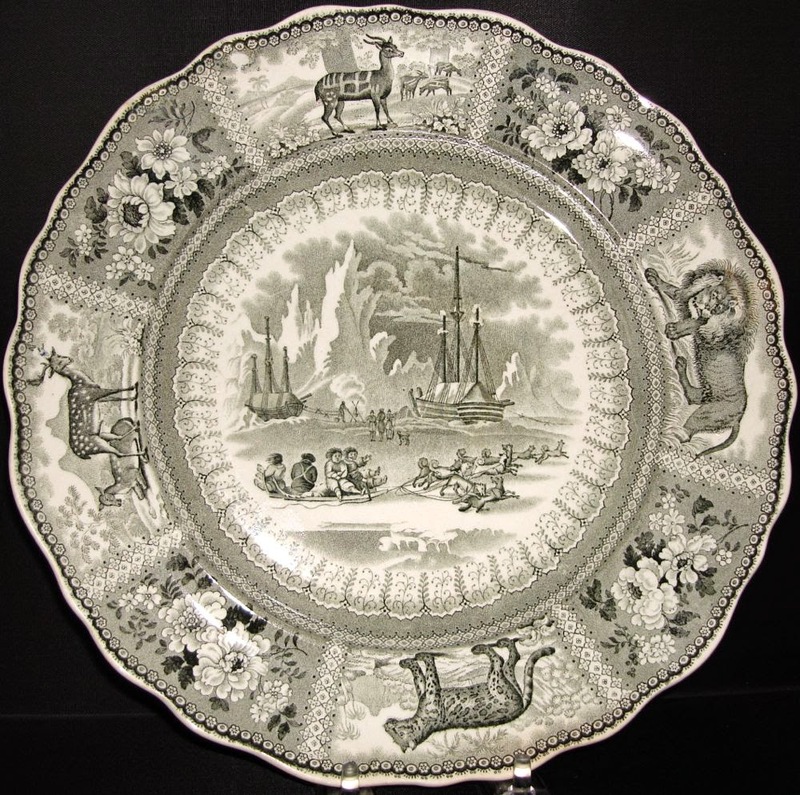 Dishy News - A Transferware Blog: "ARCTIC SCENERY" AND AFRICAN ANIMALS! 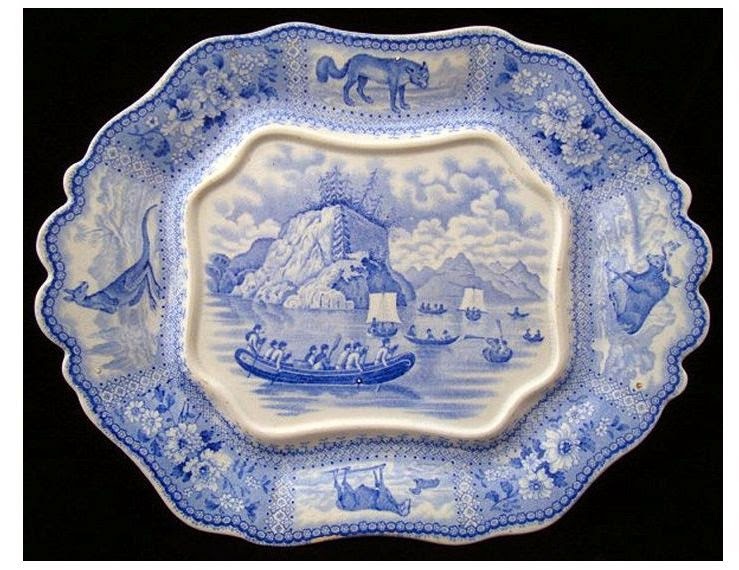 Another of my favorite transferware patterns is Arctic Scenery. I find it amusing that arctic scenes are paired with non-arctic animals (perhaps not all are African). As the editor of the Animals category of the Transferware Collectors Club Pattern and Source Print Database, I really enjoyed researching (this is a continuing project) the animal borders. 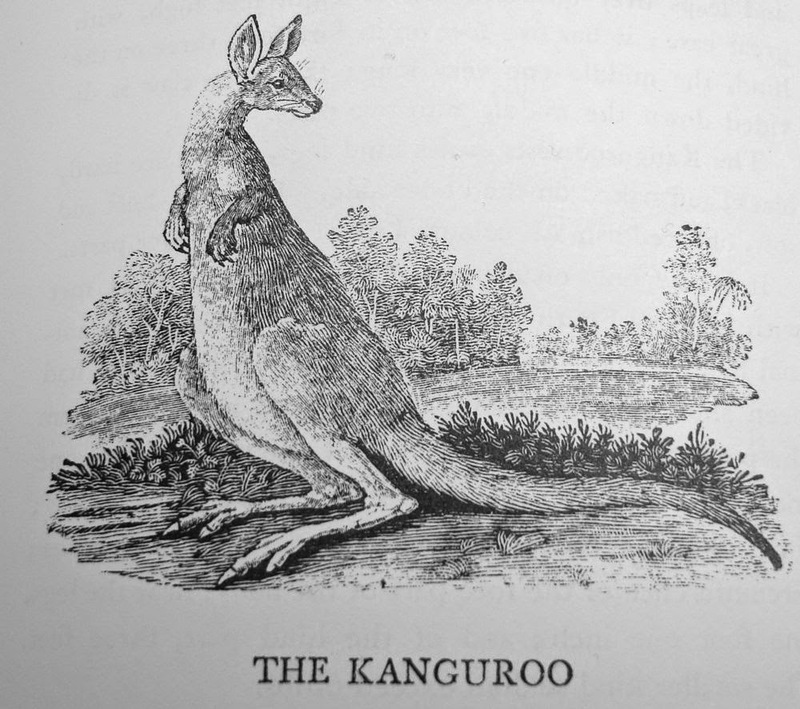 There are different animals on the borders of nearly each size and shape, and many natural history books served as repositories of source prints. 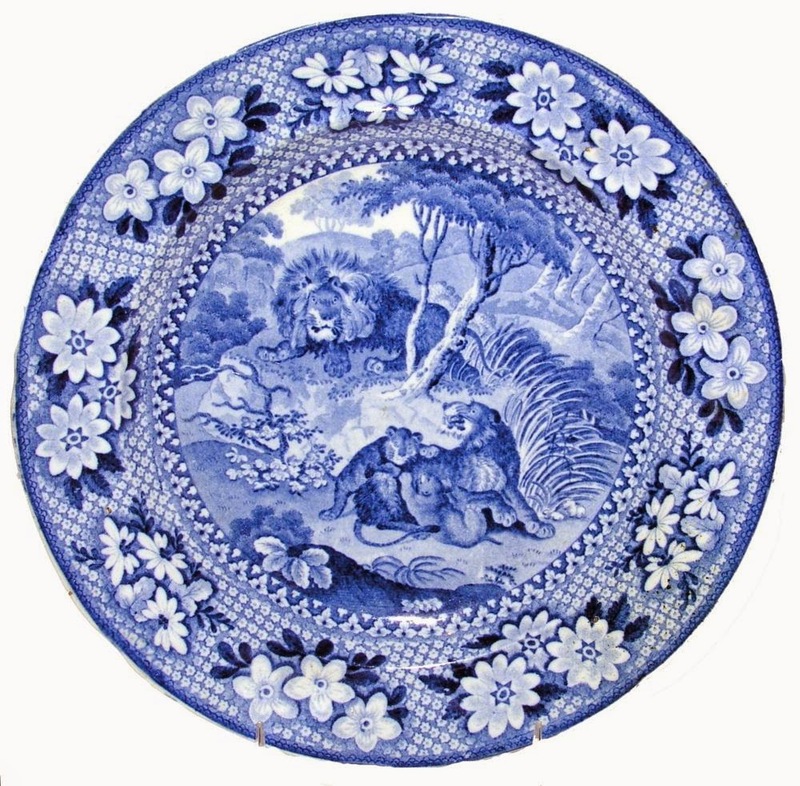 The border animals on the 10.5 inch dinner plate above are clockwise from the top; a pied goat or harnessed antelope, a lion, a jaguar, and an axis or ganges stag. The pied goat (also called a harnessed antelope) is copied from Thomas Bewick's A General History of Quadrupeds, which was first published in 1790. The jaguar and the axis/ganges stag are also copied from Bewick. The lion is copied from The History of the Earth and Animated Nature by Oliver Goldsmith, which was first published in 1774. I was familiar with Oliver Goldsmith who was the author of The Vicar of Wakefield and She Stoops to Conquer. I didn't know he was also a naturalist. The History of the Earth And Animated Nature appeared in print in eight volumes in 1774. It proved to be very popular and stayed in print throughout the 19th century. In case you wondered about the lioness, she and her cubs are on the border of the platter seen below. However, she was copied from William Jardine's Naturalist's Library, ca. 1833. The Naturalist's Library was published in 40 volumes between 1833 and 1843. 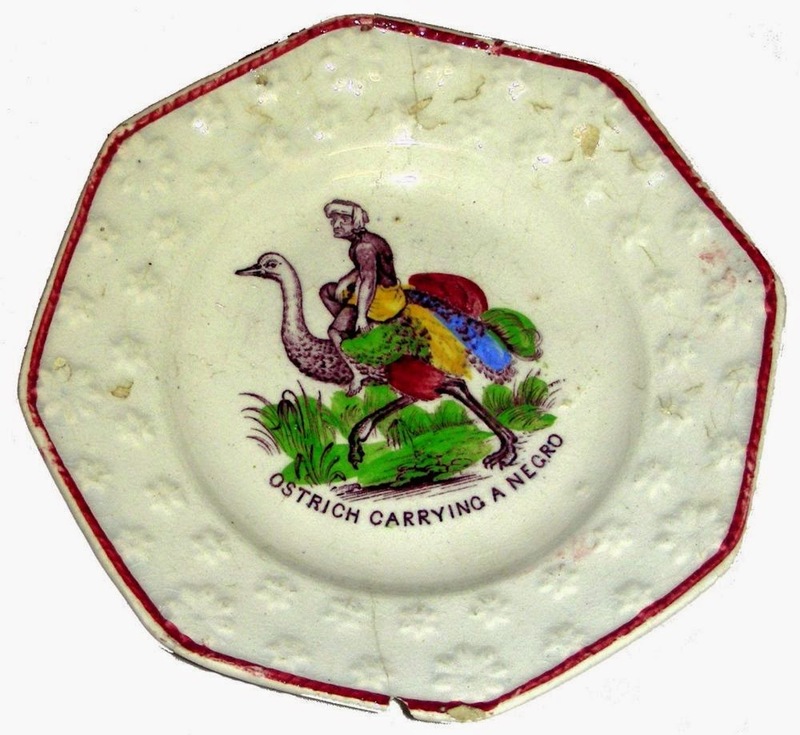 I am still looking for the source print of the man riding an ostrich. So far I have only found a child's plate with the same pattern! 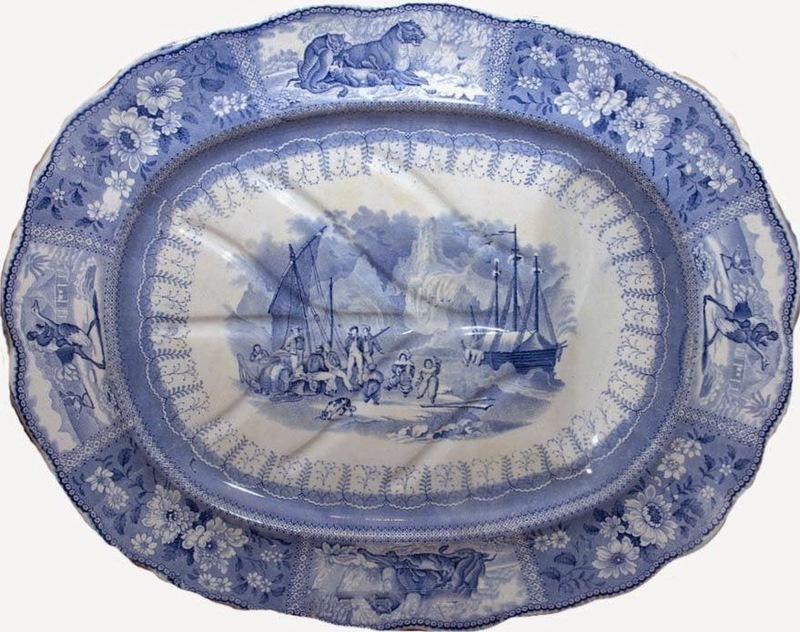 The sauce tureen undertray features a kangaroo in the border. It is from Bewick. I need to research the other animals. A job for another day. These are all of the border patterns I have researched so far. Stay tuned. If you are interested in information about the center patterns and their source prints, see the Transferware Collectors Club Facebook page, where some of the Arctic Scenery patterns have been illustrated and discussed. If you are a TCC member, search the database where 14 Arctic Scenery patterns are listed. 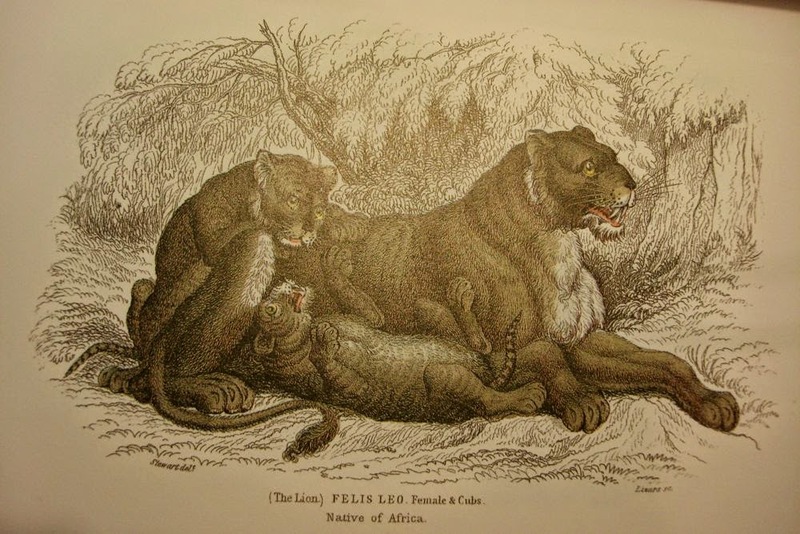 * If The Lion and The Lioness source print looks familiar, it appears in my blog post titled Lions. 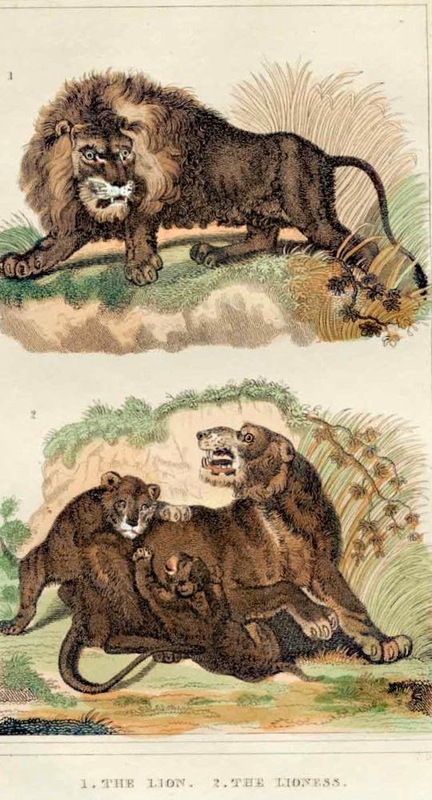 Benjamin Adams copied the print for their Lions pattern, ca. 1820. What a fascinating post. I did not know that Goldsmith was a naturalist either. As for Bewick, he is a hero of mine. I love his engravings and, after reading a biography, I love the man! I love Bewick too. I was able to buy the 1970 facsimile copy of "A General History of Quadrupeds" as well as the 1972 facsimiles copies of "A History of British Birds I & II." Which biography of Bewick did you read?